Charles Jenkins, a U.S. Army Sergeant who deserted his post in South Korea and allegedly sought refuge in the communist North Korea in 1965, died this week. He spent nearly four decades inside the “worker’s paradise” before being set free along with his Japanese wife, Hitomi, who was abducted by North Korea. Below is our interview with him, reprinted. Rest In Peace. The interview was conducted on June 27th 2013. In 1965, U.S. Army Sergeant Charles Robert Jenkins deserted his post in South Korea and allegedly sought refuge in the communist North. He spent nearly four decades inside the “worker’s paradise.” After North Korea admitted to abducting Japanese citizens in 2002 and returned them to Japan, including Jenkins’s wife, Hitomi Soga, Charles Robert Jenkins re-emerged into the public eye–a relic of the cold war, an unsolved mystery and a figure of national interest. In July of 2004, North Korea finally let Jenkins leave. He turned himself in to the U.S. Army in Japan, was given a court martial and was sentenced to 30 days in jail. 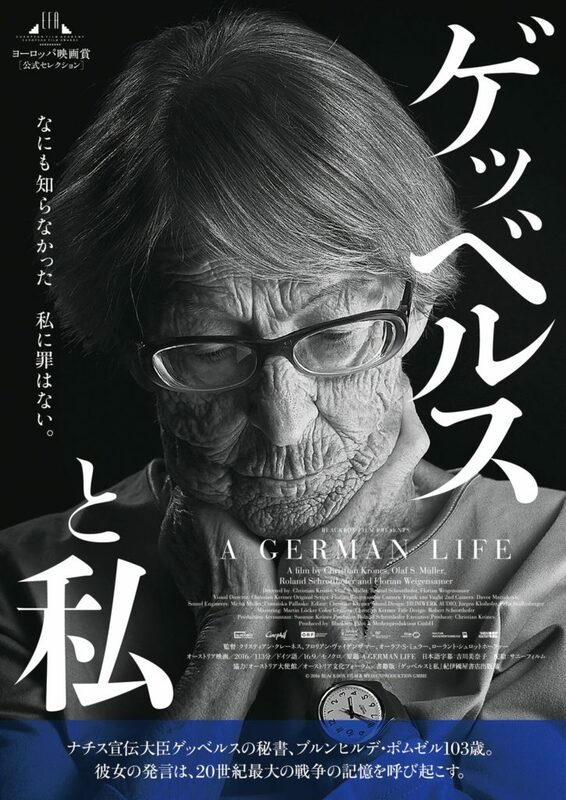 After his release, he relocated to Sado Island, off the coast of Niigata Prefecture, where he spends his days with his wife and family, working and remembering. This is part of his story. In his recollection of events, he raises questions about why he ended up in North Korea, contradicting his previous statements. Perhaps it is due to failing memory, or perhaps it is due to circumstances which even now he feels that he cannot divulge, no one– probably not even the man himself–knows completely. The gift shop of the Sado Island Legend Museum was busy and noisy that summer afternoon. Japanese tourists, mostly retired men and women can’t wait to walk around the museum’s gift shop to take a glance at one man. He is in the corner, a tired old American, who looks like he has been working in the fields most of his life, not a gift shop. The man is quietly tending to his sole duty, which is to mechanically fill the local sweet biscuit boxes, despite the noisy crowd of people calling him from all sides, Jenkins-san! Some of the tourists solicit him from time to time for a souvenir photo. The shy little man from North Carolina doesn’t smile for the photos, and he returns to his work; the pattern repeats itself until the day is done.He lived in North Korea for over 40 years after being captured inside the Russian embassy in the North Korean capital of Pyongyang in 1965, when he defected from the U.S. Army. When asked for an interview, he first shakes his head. “I cannot leave my post now. I’m on duty until 4 PM.” After asking permission to his superior, Mr. Jenkins agreed to talk. Jenkins later received a permanent resident status to remain in Japan with his wife and daughters.The reason for his desertion is still unclear, did he simply surrender to North Korea as many reported? Or did he intend to sneak into the Russian embassy in North Korea hoping that they would save him from serving out his time in North Korea? In both cases, it was huge risk. What was so intolerable in the U.S Army that pushed Jenkins and three other American soldiers to surrender? We might never get a clear answer as he swore to his army lawyer to never reveal the true reason for his decision.Jenkins told the LA Times in 2009 that he deserted because he wanted to avoid a “sure death” in Vietnam. He told JSRC that he wanted to go to Vietnam because he couldn’t make it anymore in Korea. The answer contradicts his previous statements and even after repeated questioning Jenkins would not divulge what he had promised his army lawyer never to reveal. Why is that Charles Robert Jenkins couldn’t make it anymore　in North Korea? What made him feel it was worth deserting the U.S. Army? He won’t answer. 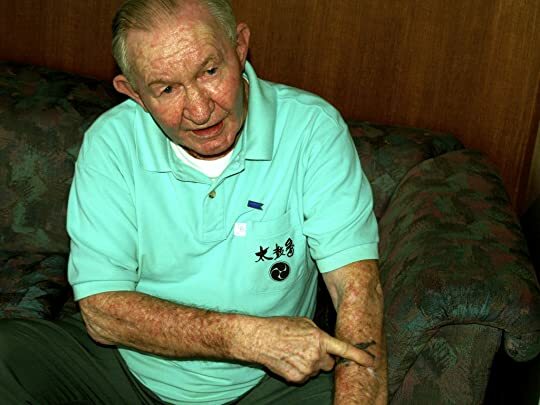 Jenkins did say he regretted almost each and every day of his captivity for the incredible act he perpetrated in 1965, until he met his Japanese wife, who is 20 years younger than him. Jenkins published a memoir, The Reluctant Communist, a book his wife didn’t want him to write as she feared North Korean retaliation. 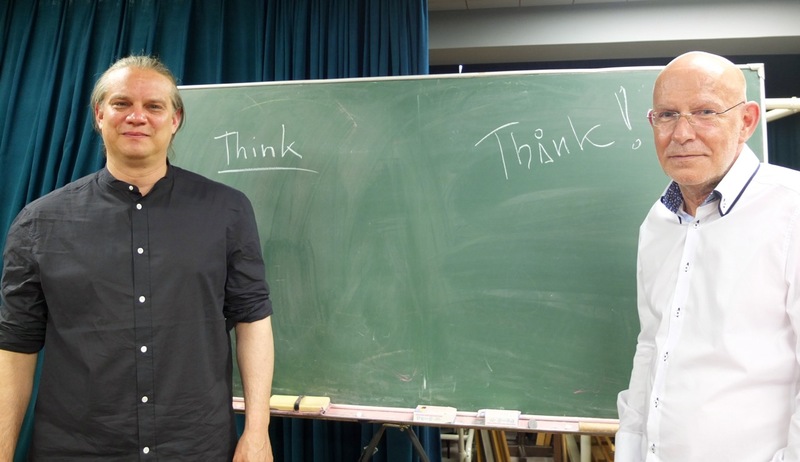 In the book, he describes how he became a reluctant celebrity when the North Korean government used him as the American villain in its propaganda films. The following is from the interview with Charles Jenkins conducted on June 27th, 2013. At times Jenkins makes cryptic remarks and appears to contradict himself in places. We have reproduced the remarks as he said them. When people saw me, they would recognize all four of us Americans in me. The producer of the movie ‘Confrontation,’ designed my character, (“Doctor Kilton”) with a horrible haircut. Once, the other defector Parrish, asked the producer how does ‘Doctor Kilton’ look? The answer he got from the North Korean producer was that Kilton’s age was about 40, but he had to make him look like he was 80. “We do not want Americans to look handsome,” the producer then explained. I can’t tell you why I decided to leave the U.S. Army, because I promised my military lawyer that I wouldn’t tell anyone. I left on a January 5th’ , about about 12 in the morning. I counted my soldiers, put them in position, I waited about an hour and it was very cold. I told them I heard a noise and that I was going to check it out. Then I said I would go back very slowly, it was 27 below zero. Anyway, that’s when I left. I took all my ammunition, I had a rifle, I had a T-shirt in my pocket, and tied it on my riffle, and walked all night like that. I walked across the biggest mine field in North Korea. They couldn’t believe that. They told me they had the biggest mines in that valley, in between these two mountains. ‘How could you possibly get through them?’ I told them, ‘Well, I know why.’ And I told them I ain’t gonna tell you why.’ They said, ‘Can ever a solider do that?’ I said, ‘Yes, any man can.’ But why in the world didn’t I hit the wires? If I had hooked the wires, I would be beheaded, phouh! (Jenkins mimed a mine explosion.) To avoid the wires, I had to step real high, and step real slow for two kilometers. (Jenkins motions the gesture by pulling his knees very high and getting them slowly down. Then when there wasn’t any man at all, the ground froze so hard, I couldn’t hit them (the mines.) It froze. I also drank a lot of beer before leaving. But my lawyer said, ‘If you were that drunk you couldn’t have made a night walk.’ But before I left, my patrol leader, Lieutenant X, me and him exchanged our guns. Because they gave me a shotgun, I couldn’t keep the shields in it. So he took my shotgun and I took his rifle. If I was drunk, he wouldn’t have given me his rifle. He wouldn’t even let me go in that zone. I wasn’t drunk, my Lieutenant let me go. If I was drunk, he wouldn’t let me go, because they would have taken my rank away. I told no one that. I wasn’t afraid of the Korean war. I wanted to go to Vietnam, but they wouldn’t let me. I had been to Korea for 13 months and I had been to Germany for 3 years. And I didn’t want to go back to Korea, but they put me there because I could speak some Korean language at that time. But they didn’t let me in Vietnam. My 13th months was due in Korea, all I was expecting was to go back in Germany or France. There are certain things I wanted to tell the U.S. I couldn’t do it in Korea. And that’s what I can’t tell. My plan was to go into Russia, they would turn me over to the American embassy and I would have gotten back to the U.S.A., straight to the Pentagon. But in North Korea they let nobody go nowhere. That’s for sure. I was ‘caught’ in North Korea, in a sense. I tried, with three other Americans, to go to the Russian embassy in North Korea. We went into the Russian embassy as if we were Russians. The Korean guards, they thought we were Russians. (He laughs) So we just walked in. The Russian embassy would have notified Moscow. Anyway at that time, the Russian president ordered us to be kicked out of the embassy. We were sent right back into North Korea. I don’t know who did it, but they put us in a room, the ambassador came in and he whispered something to the interpreter. 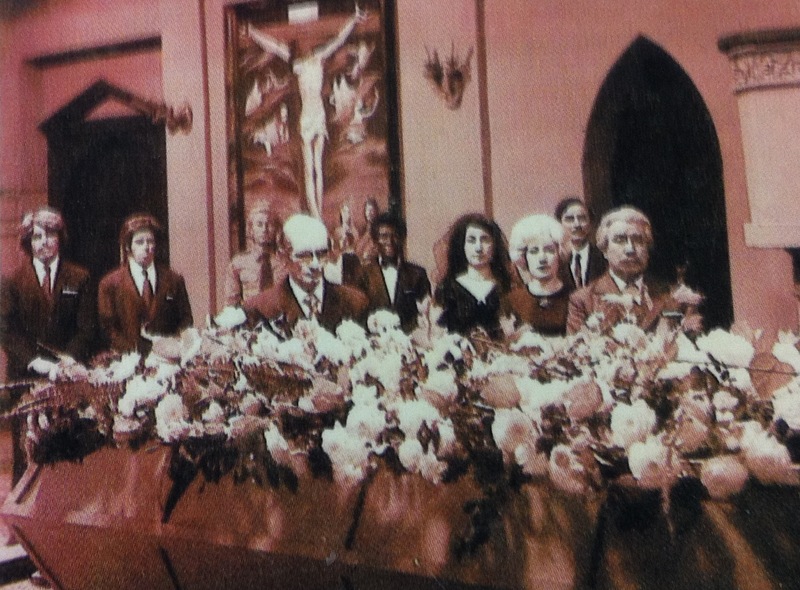 And the interpreter said, ‘Well, I’m sorry but we will have to ask you to leave.’ So that’s what we did. Right after going to the Russian embassy, you wouldn’t believe how it was. We had one guard, all he could do was to scream at us all day. We were in a cell, and he would come in and beat on the table and scream. We were forced t sit on the floor with our legs crossed and arms crossed during one hour and after an hour we had to change over. That’s the way to punish you. And at times they would tie you up and beat the hell out of you. You see this scar? (points to chin) ‘ this is where my tooth came on to my lip. You see that scar? (He shows a tattoo on his left arm.) There used to be ‘U.S. Army’ written up here. At the military university, they cut off my skin to the place where it was written U.S. Army. Some North Koreans had seen my tattoo one day as I was wearing a short sleeved shirt. They grabbed me, they don’t give no anesthetic, nothing. You know what they say? The medicines are for the battlefields. They give the medicines to the military, not to the hospital dispensary. That’s where they cut off my skin. They took scissors and cut it off. The first seven years they saw us as Korean War veterans. The Korean people hated Americans. The colonels and the high ranked officials were not so bad, but the lower ranked soldiers hated Americans. We weren’t sent to reeducation camps, we got educated right there in our place. In the prison, they were always threatening us. They said they would make an example out of us. And I was often the one made an example, because I made more trouble than anybody. Also because I was the highest ranked. I regretted every single day I defected from the U.S. army until I met my wife. After that, I thought, ‘Well, if I wasn’t here, it would have been hard for her.” Because if she hadn’t married me, she would still be in North Korea right now. That’s for sure. But then, when Koizumi came back to North Korea, to meet Kim Jong-Il the second time, that’s when Kim Jong-Il agreed, if I want to leave, I could leave. (crying) But they thought I would come back (to North Korea) because I would go to jail in the U.S.A. They knew that. So, that’s how I came back. If my wife wasn’t sent back (to Japan) I wouldn’t be here. Prime Minister Shinzo Abe is due to make a statement today to commemorate the 70th anniversary of Japan’s defeat in World War II. He said he will uphold the statements made previously on the subject, but people are concerned that he will downplay Japan’s previous apologies. 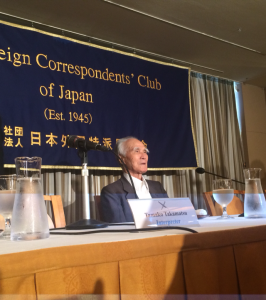 Former Prime Minister Tomiichi Murayama, who made the 50th anniversary statement on the war, spoke at the Foreign Correspondents Club of Japan recently, expressing his concerns with Abe’s statement. 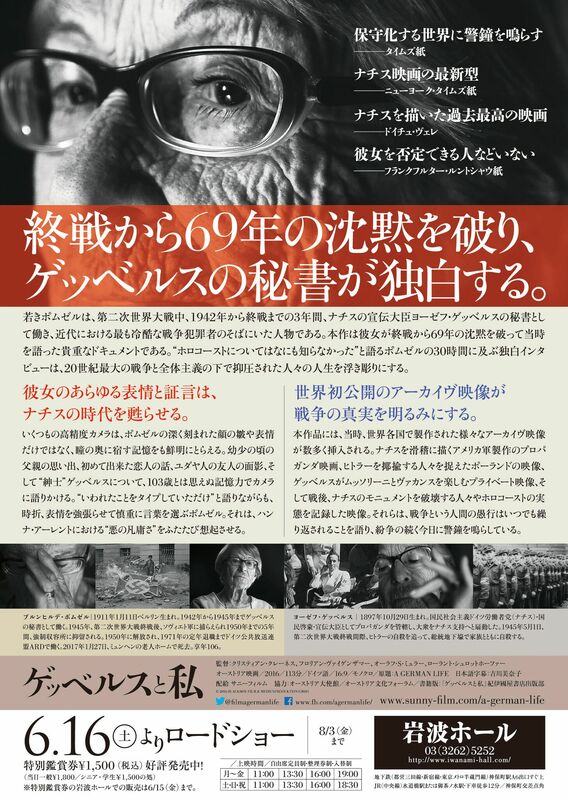 There is worry that Abe may downplay the Murayama Statement, which apologizes to Korea and China for crimes committed in WWII. Abe has been making comments in attempts to downplay the Murayama Statement, as a result, more and more young people are paying attention to the statement and asking questions about it. Many of these young people have been born after the war, and it’s prompted them to start learning about Japan’s war history on their own. Due to the fact that Abe is trying to go on the offensive and bulk up Japan’s military, Murayama thinks that there is great danger in the fact that Abe cannot acknowledge that crimes committed during the war were a mistake. Now with the upcoming 70th anniversary of the war, Murayama feels that it is a milestone year that Japan needs to acknowledge. The Potsdam Declaration was a statement issued in 1945 that called for Japan’s surrender during World War II. It was essentially an ultimatum given to Japan by the U.S., U.K. and China stating that Japan must surrender or face consequences. 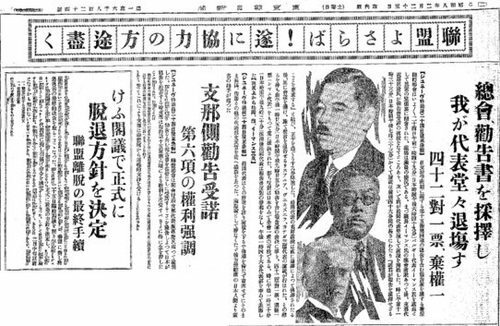 When asked about the Potsdam Declaration, Abe said that he has “not read the Potsdam Declaration in detail” and he doesn’t believe that the war was a mistake. 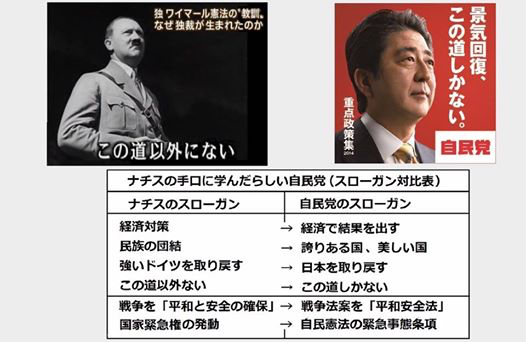 Abe’s crusade to nullify or even destroy Japan’s post-pacifist constitution, which also gave the Japanese citizen “basic human rights”, is not given him any popularity points within the country as well as Japan’s neighboring countries. He is intent on destroying Article 9 of the Japanese Constitution. Article 9 is a clause in the constitution outlawing Japan from using war as a means to settle disputes. Japan has experienced peace for 70 years, which is an extraordinary thing. 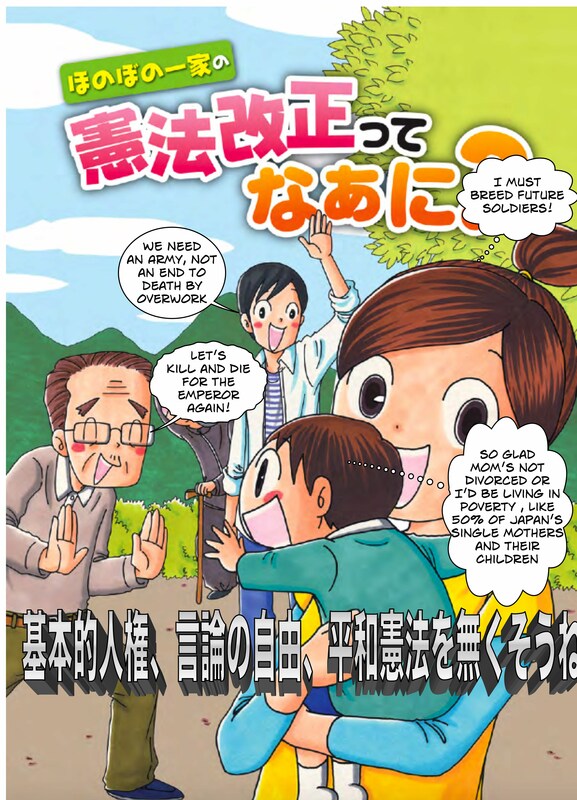 Japanese people are worried that the tensions with other countries will escalate if Abe continues to along this path. Murayama also noted that the security legislation Abe and the LDP is pushing through the Diet is considered unconstitutional by an overwhelming majority of scholars. In that statement that we need to study history and his pointing out that Abe had not read or understood the Potsdam Declaration, Murayama seemed to be saying to his successor, “Those who don’t study history are doomed to repeat it. And if you knew your history, you’d make a proper apology. Get smart or shut up.” In many ways, the press conference was like a wise, cranky old teacher scolding a lazy student. However, will the lazy student listen?